The purpose of this study is to determine the size of your heart, to evaluate how well your heart is functioning or pumping and to assess the structure and function of the valves within the heart. 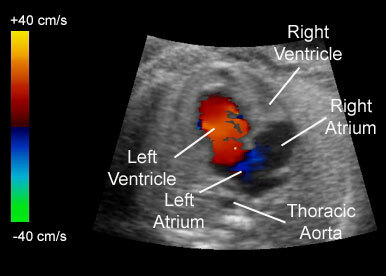 A 2-D (or two-dimensional) echocardiogram is capable of displaying a cross-sectional “slice” of the beating heart, including the chambers, valves and the major blood vessels that exit from the left and right ventricle. A Doppler echocardiogram measures the speed and direction of the blood flow within the heart. It screens the four valves for leaks and other abnormalities. By assigning the color to the direction of blood flow, (Color Flow Mapping), large areas of blood flow may be studied. These color flow mappings allow abnormal blood flow characteristics to be interpreted by the cardiologist. Other than wearing loose-fitting clothing, there are no special restrictions or preparation prior to a 2D Doppler echocardiogram. Although the gel is water soluble and should not stain; it is messy and could get on your clothing so please be aware and dress appropriately.